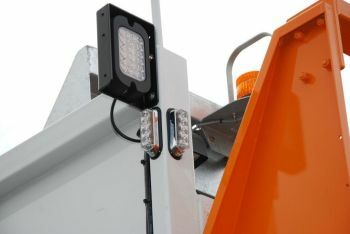 West Devon Council is showcasing the latest in LED (Light-Emitting Diode) warning lights and beacons from Innovative Safety Systems Ltd on its new fleet of refuse, recycling and cleansing vehicles. LED is ‘low draw’ and uses only a tiny percentage of the power that equivalent traditional incandescent bulbs use, so no flat batteries. With no glass tubes to break and their internal parts rigidly supported LED lamps are resistant to vibration and impact, making them perfect for the harsh environment that refuse and cleansing vehicles operate in. The new fleet is part of West Devon Council’s new and improved recycling and waste collection services, starting from 27 September. The new service will enable householders to recycle all plastic bottles, plus textiles, batteries, mobile phones and spectacles. A food waste collection service, which generates electricity for the national grid and produces compost for local farms, is also being introduced. Focsa Services (UK) Ltd is a waste and environmental management company delivering a full range of quality waste and environmental services to both municipal and commercial clients. Services include domestic refuse collection, recycling services, commercial waste collection, street cleaning, civic amenity site management, clinical waste collection, grounds maintenance, vehicle maintenance, fleet management and more.